A Keynsham man has raised more than £2,000 in honour of his stepson after taking on a tough triathlon challenge. 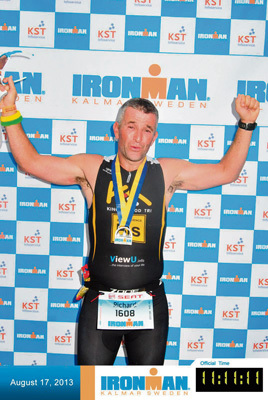 Richard Franklin headed to Sweden last month to compete in the Kalmar Ironman Triathlon, in a bid to raise funds for a local charity that supports his disabled stepson Ryan, 15. The event included a 2.5-mile swim, a 112-mile cycle followed by a 26.2-mile marathon, and Mr Franklin undertook months of training supported by Kingswood Triathlon Club. The hard work paid off when he completed the swim in around one hour 25 minutes, the bike ride in five hours and 37 minutes and the marathon in three hours and 57 minutes. He said: “The total time to complete it was 11 hours, 11 minutes and 11 seconds, which was beyond my wildest dreams. I was thinking it would take more than 12 or 13 hours to complete it. Money raised by Mr Franklin will go to Keynsham and District Mencap Society, which runs several groups and activities for people with a range of learning disabilities, including a Tuesday Club, which Ryan attends. Find out more about the challenge or donate at www.just giving.com/richard-franklin2.